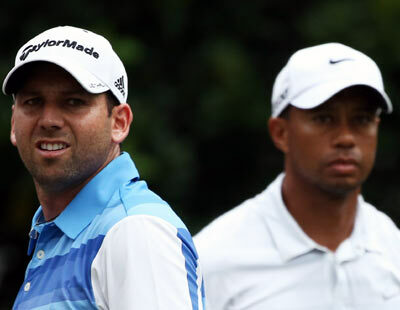 The feud between world number one Tiger Woods and Sergio Garcia deepened when Woods described the Spaniard's "fried chicken" jibe as "wrong, hurtful and inappropriate" on Wednesday. Woods reacted on his Twitter account after Garcia issued an apology to a comment he made at Tuesday's European Tour awards dinner when he was asked on stage whether he would be inviting Woods for dinner during next month's US Open in Merion. "We will have him round every night. We will serve fried chicken." Garcia was heard to say. Fried chicken has become a racial stereotype in the United States when referring to African-Americans - a reference to the days before the abolition of slavery when chicken was believed to be a staple part of the diet. Garcia moved quickly to explain his remark, issuing an apology through the European Tour. "I apologise for any offence that may have been caused by my comment on stage during The European Tour Players' Awards dinner," the Spaniard said. "I answered a question that was clearly made towards me as a joke with a silly remark, but in no way was the comment meant in a racist manner." Woods, whose relationship with Garcia is frosty at best, was in unforgiving mood, though, and took to Twitter to express his annoyance at the comment. "The comment that was made wasn't silly. It was wrong, hurtful and clearly inappropriate..." the American said. Garcia's comments echoed those made by former Masters winner Fuzzy Zoeller in 1997 when he joked with reporters to tell Woods not to ask for "fried chicken or collard greens or whatever the hell they serve" at the next year's Champions dinner. Zoeller was subsequently dropped by two sponsors. Garcia and Woods have been at loggerheads after the Spaniard blamed a roar from the crowd watching the 14-times major winner for an errant shot when the two featured in the same group at the Players Championship in Florida. The gallery erupted during the Spaniard's backswing upon seeing Woods reach for his five-wood for a daring escape from a tee shot deep into the trees.